When installing a grommet to the body, ensure that the brake line passes through the center of the grommet. 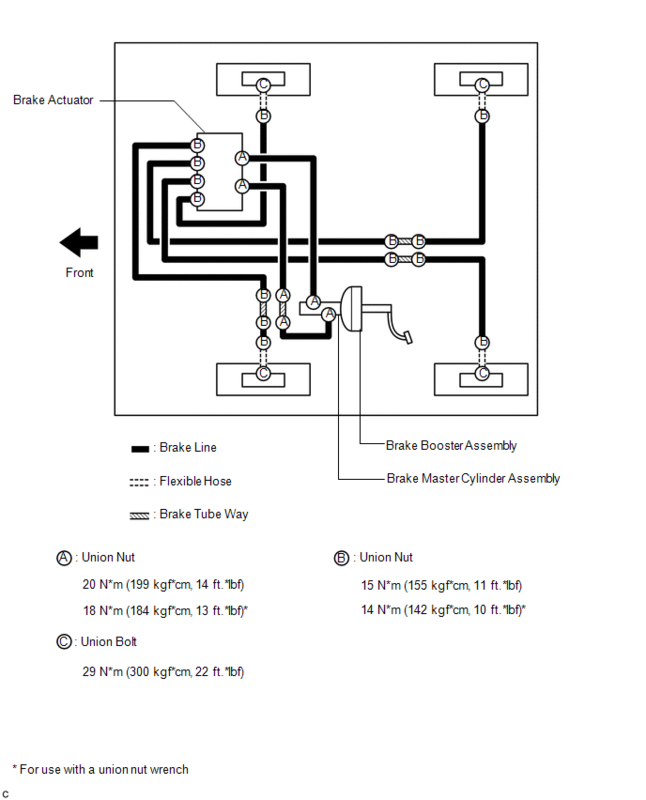 When installing a brake line or flexible hose, ensure that they are free from twists or bends. If the metal end of a flexible hose does not match the groove on the bracket, twist the hose slightly to insert it. Flexible hoses must be free from shock absorber oil, grease, etc. 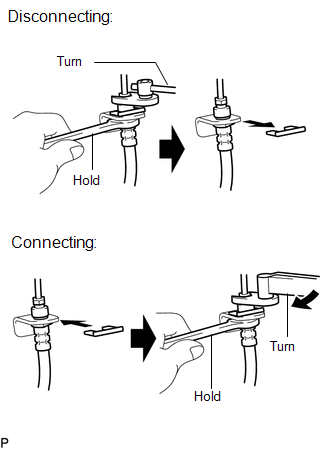 When installing a brake line to a plastic clamp, ensure that the brake line is not loose or pinched. Do not reuse any clips or plastic clamps removed from a flexible hose. After installing a brake line or flexible hose, ensure that they do not interfere with any other components or body. Do not allow brake fluid on any painted vehicle body surface. If brake fluid leaks onto any painted surface, immediately wash it off. Hold the flexible hose with a wrench and disconnect the brake tube using a union nut wrench without deforming the tube. Remove the clip and disconnect the flexible hose. Secure the flexible hose with a new clip. At this time, be sure to securely install the clip. Connect the brake tube using a union nut wrench without deforming the tube. Support the way to prevent the brake tubes from being deformed and connect each brake tube using a union nut wrench. 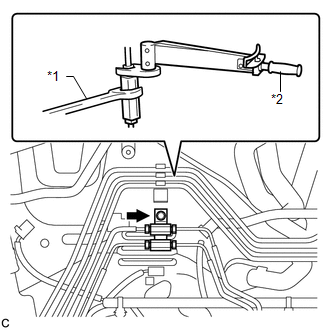 Support the way to prevent the brake lines from being deformed and install the way to the vehicle body with the bolt.